Again as in the past three years we had a tremendous rain storm one week before World Snow Day, which nearly ruined Arrowhead Recreation Area's slope. 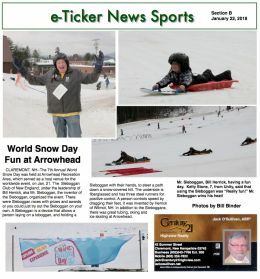 However, Arrowhead worked around the clock to make enough snow that we had a pretty successful event with the tubing runs being the most active. We were able to provide a number of Sleboggan Train Rides to the younger participants and their parents. We gave fewer Sleboggans lesson and had fewer participants in the two classes of Sleboggan Cross. Four participants attempted to break the World Sleboggan Speed Record, which we were not able to attempt in the past three years. One participant got within 3mph of the record, however, because of the near 50 degree Fahrenheit temperature the conditions were just a bit to slow to break the record. Looking forward to next year and a January without a thaw. 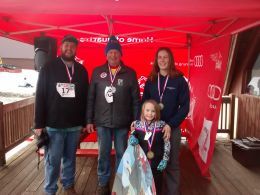 The winners of the Sleboggan Cross races. 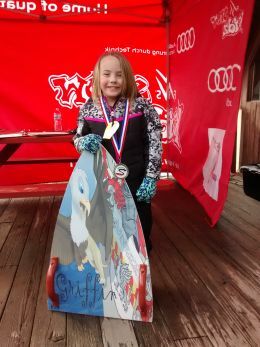 The 14 and under gold medal winner of the Sleboggan Cross. Other winners in this group had left the area before the medal presetations.